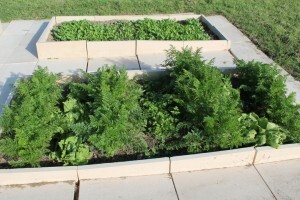 Carrots and Lettuces in our new veggie garden, with Cime di Rapa seedlings behind. Autumn came with a rush this year. March was very wet and quite warm, then April hit, night temperatures averaged 6°C to 8°C, and our garden was full of dead leaves. Now it’s the 3rd of May and today is wet and not forecast to top 9°C. We’ve had quite some success with the new veggie garden. 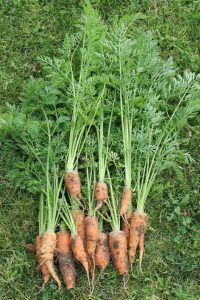 It still isn’t looking particularly attractive, but we’ve got a crop of carrots coming along great guns. There are also some younger radishes looking promising and a whole bed has been seeded with cime di rapa, which have sprung up very quickly. I had left green manure growing in the fourth bed and that has now been dug-in, but as it’d already gone to seed, I may leave it to regrow over winter. Some carrots from our garden. The native strip hasn’t been doing too well. Most of the plants hadn’t been looking particularly healthy, and now they’ve been overrun with weeds. When I get the chance, I intend to have a go at covering the whole thing with mulch, leaving only the most promising of the natives clear. Our bulbs have been thriving; with the dahlias flowering strongly throughout April, and various other bulbs tentatively sprouting up through the garden beds and lawn. I really need to make more of an effort to map where each plant is growing, so that we can dig up some of the bulbs later for redistribution around the garden. 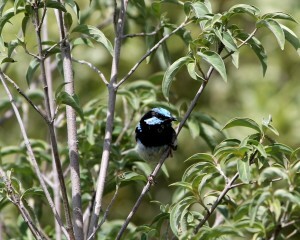 We have some very cute Superb Fairy-wrens who hang out in a hedging type plant on the borders of our garden. Normally they flit about too quickly for me to photograph them, but I recently managed a few good shots. 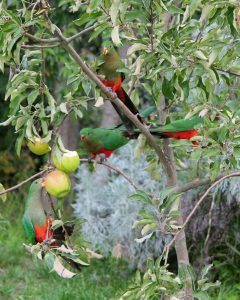 Our Apples continue to be popular with the local birds. 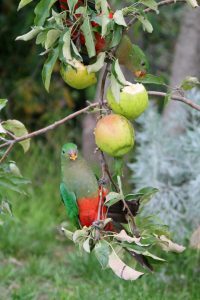 A couple of months ago it was a Currawong that was helping itself to them (although only the damaged or over ripe ones, as I don’t think his beak could get purchase on the others). 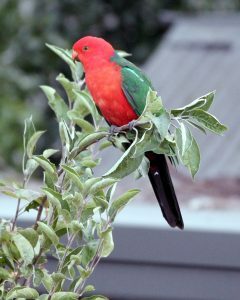 Now it’s the King Parrots that have come along to raid the tree. 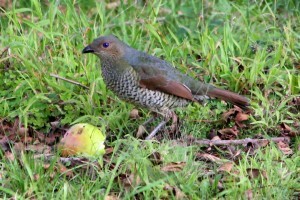 We had four females fighting over the fruit, while a male sat at the top of the tree, apparently keeping watch. On top of the birds visiting our garden, we’ve had hoards of cockatoos flying by overhead. Flocks of Sulphur-crested cockatoos squawking like crazy, but also pairs and occasional larger groups of black cockatoos, with their mournful cries and purposeful flying. 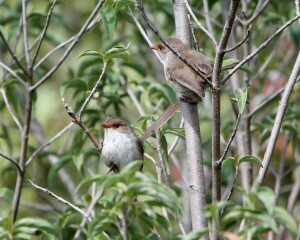 For two birds from the same species, their temperaments couldn’t be more different. Presumably thanks to the wet March, the local fungus has had a particularly good year. We didn’t manage to photograph any of the mushrooms at their best, but by early-May, they were still looking decidedly impressive. 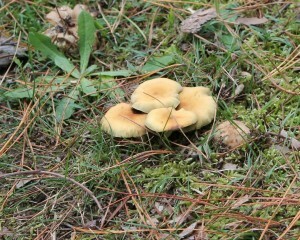 Some thriving autumn mushrooms in our local area. 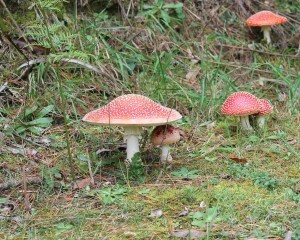 Local toadstools, seemingly straight from a fairytale.